At this time of the year outdoor spaces become as important as indoor, an extension of our homes. A beautiful but practical outdoor surface is essential for garden terraces, patios, pathways and pool surrounds and Mandarin Stone have plenty of options. For an authentic feel opt for large format flagstones; from antique finished limestone and marbles to naturally 'riven' slate and sandstone. They offer an array of shades from paler buffs right through to darker greys and blacks. A contemporary finish can also be achieved by selecting 'flamed granite,' or 'honed sandstone' flagstones. 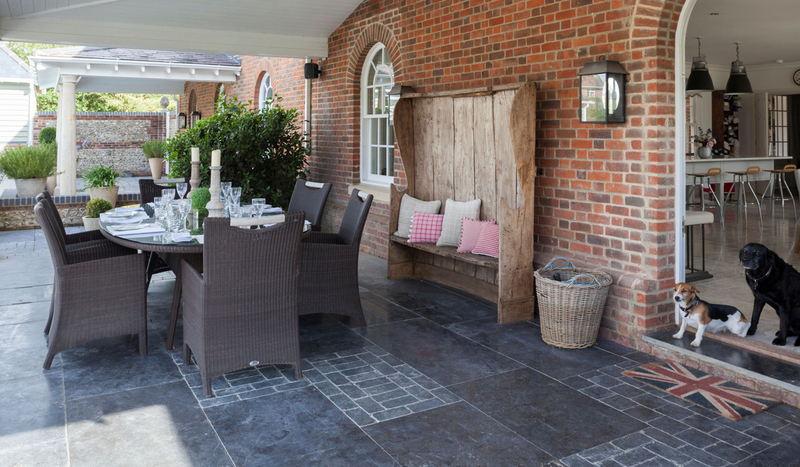 The ever fashionable 'finely riven' slates will work equally well in both modern and traditional settings. Quirky 'cobbles' are a popular choice; use alone or for interest underfoot, or combine cobble and flag formats of the same stone together. Outdoor stones tend to be of thicker depth, but many of these stones are available for inside use, so a seamless finish between your indoor and outdoor living space can be easily achieved. Installation is relatively simple and the sealing of external stone is optional. Mandarin Stone can advise on both surface design and suitability for all outdoor projects. One of Mandarin Stone's most popular ranges, ‘Dijon’ Tumbled Limestone, is available both for indoors and outdoors, and is used to stylish effect at Clifton Nurseries Surrey in the Show Garden. Not dissimilar in appearance to traditional French or English Limestones, 'Dijon' Tumbled Limestone offers an authentic feel with rounded corners and edges which create a lived in feel, and the soft, neutral tones work well with virtually everything including the contrasting larch floor boards in the Show Garden. Above photo and blog article courtesy of Mandarin Stone. Mandarin Stone are one of the largest importers and stockists of natural stone tiles, flooring and stone bathware in the UK.